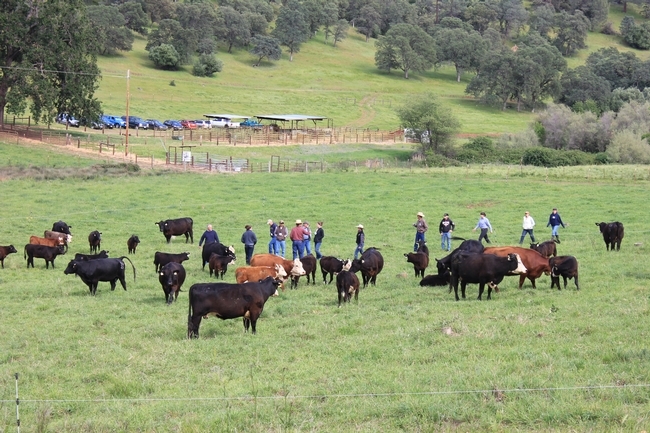 The annual California Grazing Academy held at UC SFREC and led by Roger Ingram, Nevada/Placer County UCCE Director and Livestock Advisor was once again a widely attended and engaging event. Over a third of an inch of rain cooled off the 24 participants that attended the two-day event that mixed lectures and hand-on activities to explore and demonstrate key principles that drive the ability of producers to be successful grass farmers. Topics included controlled grazing principles, water and mineral cycles, pasture cell design, rest/grazing periods, nutrition and supplementation as well as grazing planning and monitoring. Each participant had the opportunity to visually estimated carrying capacity, install electric fencing, move cows with calves into their designated paddocks, and watch the cattle consume pasture grass over a period of 24 hours. This annual training has remained hugely popular across California and the West with some participants coming as far as Utah to learn from UCCE and Roger Ingram. We looked forward to another year!